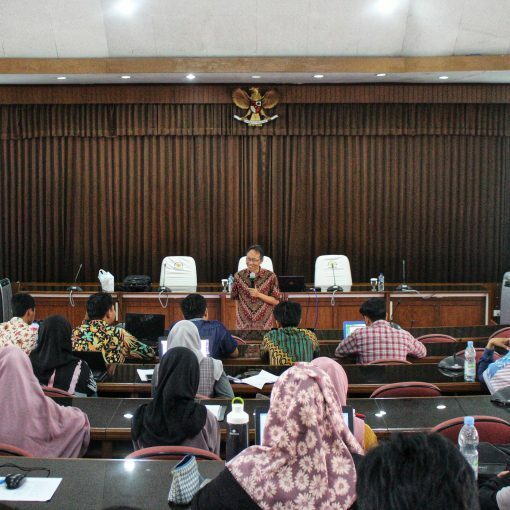 Yogyakarta, to improve the ability of students in writing scientific papers following the rules of proper use of Indonesian language, on November 16th 2018, Master of Science and Doctoral Program, Faculty of Economics and Business, Universitas Gadjah Mada (MD FEB-UGM) held a public lecture. Public lecture with the theme: Reference to academic/professional writing and general term formation guidelines (PUPI) delivered by Prof. Suwardjono, PhD, who is an Accounting Lecturer at FEB UGM. Departing from the concerns of Prof. Suwardjono, Ph.D related to the weak vocabulary of Indonesian vocabulary which is owned by students and globalization which requires individuals to adapt to global needs, Prof. Suwardjono, Ph.D has initiation to provide guidance on how to use proper and correct Indonesian. In his seminar Prof. Suwardjono, Ph.D explores student involvement in the use of Indonesian. Some students said that there were many vocabulary words in Indonesian that had not been mastered. Prof. Suwardjono, Ph.D advised students to learn Indonesian at a high level. Mastering high Indonesian in accordance with the level of scientific / professional education has several characteristics, namely; 1) the ability to express complex ideas and abstracts carefully, 2) use standard or formal language, 3) not submit to social, lay, famous, or journalistic words at the expense of accuracy of meaning, and 4) communicative among scientists and professionals (who willing to learn to continue to progress). Also, when they have mastered language skills according to their level, several key successes must be possessed when they want to write. That is, having strong ideas, documenting what is experienced or crossing their minds, having strong drives, having specific goals, having self-confidence, master the techniques of writing, mastering languages, and have the willingness or courage to be criticized.